Chart No. 6 - Polarity Therapy Applied to the Extremities for Heart Trouble. A double polarizing contact on the first joint of each second toe. A lateral polarizing contact on the first joint of each second toe. A double polarity contact on the sore spots between the tendons on top of each foot, supported by thumb pressure on the sore spots on bottom. 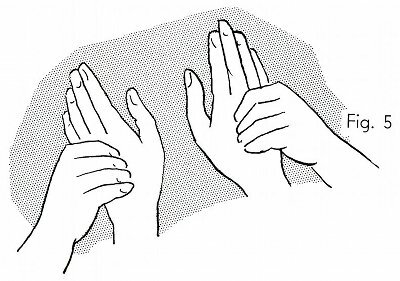 A double polarizing contact on the first finger tips, anterior-posterior and lateral pressure on the first joints. A polarity pressure contact on the sore spots between the tendons on top of the hand, with the thumbs in the palm areas. Book 4, "Explanation of Chart No. 6"